Update: Try searching for June 18-25 if you're having trouble finding the cheap price using June 18-26. Make sure you're using the flexible date search (it should be checkmarked by default). So AirCanadaVacations.com just dropped the price of their June 18 to 26 flight from Edmonton to Cancun, Mexico down to about $300 roundtrip after tax. Pretty great price right? $719 roundtrip after all taxes/fees for all 4 flights! That's $179 per ticket. A family of 5 can get it down even further, to $160ish. Octomom could get an even better deal. Looks like the age cutoff for paying the 'tax only' is 12 and under. And be aware that the flight on the way there requires an overnight stay in Calgary (but not on the way back). 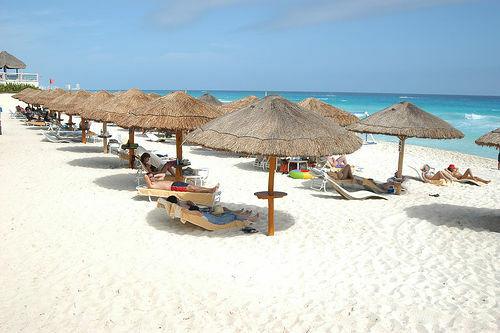 edmonton, yeg, flight deals, mexico, cun, cancun and air canada vacations.